Totnes MP Sarah Wollaston paid a visit to the ground-breaking community project LandWorks, to mark six successful months for the scheme. She praised the work being done to give offenders skills and life experiences to help them avoid returning to crime after they are released. LandWorks works with offenders from HMP Channings Wood, at Denbury near Newton Abbot, in the months before and after they are released, and others who are subject to probation supervision in the local community. 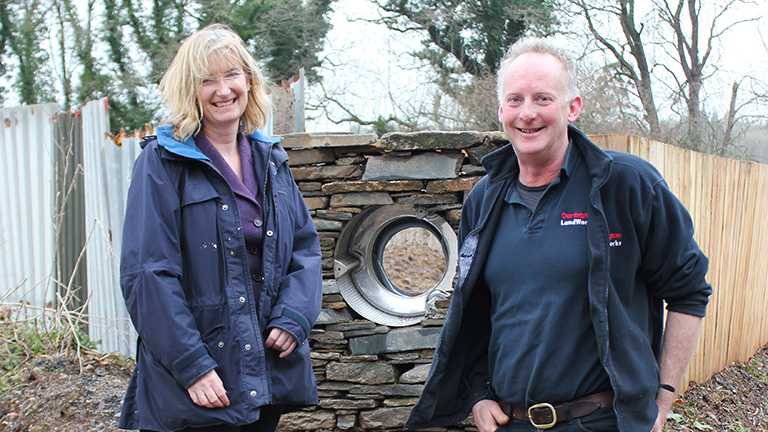 The HMP Channings Wood and the Devon and Cornwall Probation Service have established a strong working relationship with LandWorks – a rural project providing intensive support to give offenders the practical skills to help them get a job. It also provides placements once men are released, and gives them vital support as they re-engage in society. Sarah Wollaston MP, who launched the scheme at Quarry Field on the Dartington Hall Estate in September 2013, said: “It’s wonderful to return and see the progress that is being made. “I enjoyed the opportunity meet again with those who are benefiting from their involvement with LandWorks. I heard not just about the skills they are learning and how positive the experience is, but how it can turn their lives around. “I think this model of trainees working with volunteers in the local community, who are able to share their skills, is a brilliant way to help people feel part of their community, rather than risk being cut adrift when they leave prison. With up to five offenders on the scheme at a time, their combined efforts have already seen a garden and wood-working area built, with a focus on acquiring landscaping and construction skills. Sculptures and benches have also been made at the site, on the Dartington Hall estate near Totnes, to help raise funds to support the project. In England and Wales, almost half of prisoners are convicted of another crime in their first year of release. Getting work has been identified as one of the most important factors that stops this, but is hindered by people’s lack of skills, experience and a criminal record. Chris Parsons, LandWorks Manager, said: “The offenders and ex-offenders we work with have never had the chance to do something like this in their lives before. “They have been looking forward with immense pride to showing Sarah around and all the work that they have put in. You can see the confidence and self-worth that the project gives them. The training and work experience programme is growing now, and we’re hoping that more people and businesses in the local community will volunteer and work with us. LandWorks currently provides up to five places at a time but is hoping to expand over the coming year if it can secure further funding. People have to apply for the scheme before they are released from prison, outlining their motivation to change and stating what they want to achieve from the training. They are then assessed for their suitability and commitment.